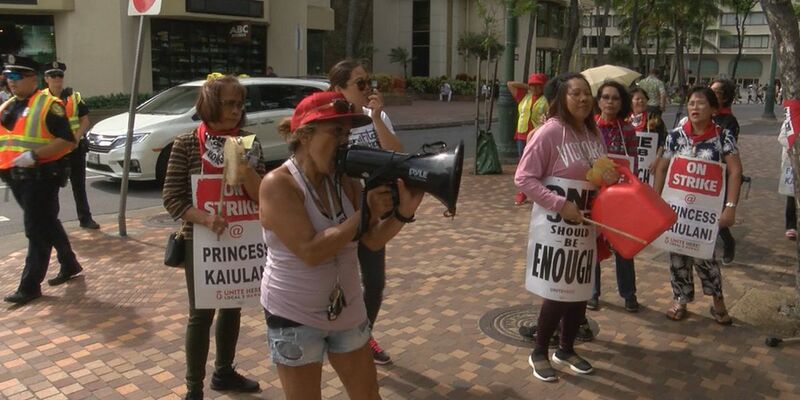 HONOLULU (HawaiiNewsNow) – Some 2,700 Hawaii hotel workers are expected to remain on strike through the Thanksgiving holiday. In a statement, Kyo-ya Hotels & Resorts, said that negotiations with UNITE HERE Local 5 failed to result in a deal and that both sides aren’t slated to return to the bargaining table until Nov. 26. “We are extremely disappointed that Local 5 leadership rejected our latest offer which would have been the largest increase in compensation for any of the striking markets nationwide,” Kyo-ya said, in the statement. Kyo-ya said it offered a wage increase and no changes to benefits for all active employees. But the company did not say how much of a pay increase it was offering. The Local 5 strike, which began in early October, impacts five hotels operated by Marriott and owned by Kyo-ya: Sheraton Waikiki, The Royal Hawaiian, Westin Moana Surfrider, Sheraton ‪Princess Kaiulani‬ and Sheraton Maui. The strike is the Hawaii hotel industry’s longest work stoppage in nearly 50 years.